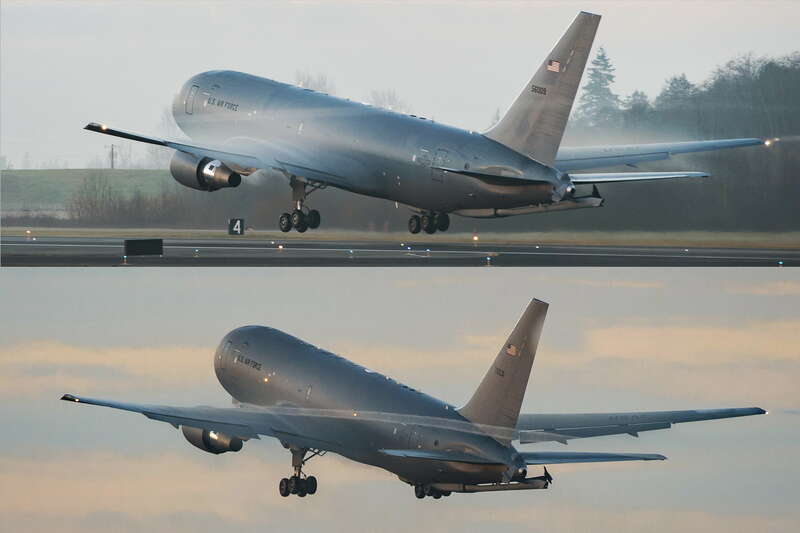 The first two Boeing KC-46 Pegasus aircraft departed Everett’s Paine Field this morning for McConnell Air Force Base (AFB), where the 22nd Air Refueling Wing (22 ARW) will be the first unit to have the world’s newest air refueling tankers. McConnell, in Wichita, Kansas, will receive two more tankers in the weeks ahead. Then Oklahoma’s Altus Air Force Base will receive four planes to support aircrew training. The Air Force will soon begin evaluating the Boeing KC-46’s systems in operationally realistic scenarios, which is required before the aircraft can be used in combat. It will also continue validating the Boeing KC-46’s refueling capabilities, with aircraft including the Northrop Grumman B-2 Spirit bomber, Lockheed C-5 Galaxy cargo plane, and Lockheed Martin F-35 Lightning II fighter. Prior testing involved the Boeing B-52 Stratofortress bomber, Boeing C-17 Globemaster III cargo plane, and McDonnell Douglas F-15E Strike Eagle and McDonnell Douglas F/A-18 Hornet fighters, among others.